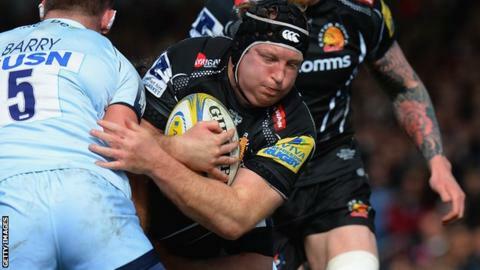 Exeter boss Rob Baxter says leading try-scorer Thomas Waldrom will be key to their chances of victory in their Champions Cup quarter-final. The Chiefs travel to Wasps, a team Waldrom scored a hat-trick against in their last meeting in December. "He's very important," Baxter told BBC Sport, ahead of Saturday's tie at the Ricoh Arena. "He has a unique set of skills that do make him very dangerous and a real try-scoring threat." Waldrom, 32, joined Exeter in the summer of 2014 and made an instant impact, scoring a Premiership-best 16 tries in his first season. This term he did not score a try until that hat-trick against Wasps on 5 December, but the former England number eight has since taken his total to 17 in just 16 games. "I think Tom, like any decent player, will be aware that he's one cog in a machine that has to function very well," Baxter said. "For a lot of the guys, it's about getting Tom Waldrom in range of the line and then helping him get over there, that's how a team works." But Baxter insisted Waldrom's importance is not limited to just scoring tries from close-range. "What Tom will ultimately end up giving to the side will be more important in other areas of the field because he is a go-forward carrier for us all over the pitch, not just close to the line," he added. "The stuff close to the line is a little bit like the icing on the cake for him, ultimately what really works for us is the momentum he gives us in other areas, and that's what we have to work on, where we gain our momentum throughout the game to try and create those five-metre opportunities." The quarter-final is Exeter's first-ever knockout game in European club rugby's top tournament.